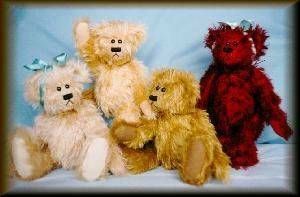 Hoo Bears are real mohair teddy bears, designed and hand-crafted for collectors by Helen Oliver in Crowle, Worcestershire, England. Read the Terms and Conditions of Sale first! 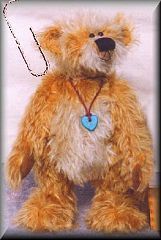 Happily, Helen's Hoo Bears are very popular, and consequently she does tend to have a full order book for a few months in advance. As a result, there can be a delay in delivery of a couple of months. We try to keep the wait to a minimum, so please don't be put off - they are worth the wait!! Complete the form and send it with any agreed payment to us at the address below, so as to confirm your order. If you have opted to pay by credit or debit card through , we will send you an "invitation to pay" to your nominated email address. If you should have any queries at all, please do not hesitate to contact us. All stated sizes are approximate only. Actual colours of bears and materials may differ slightly from the images featured. This is due to the inevitable effects of the photographic / video reproduction processes involved. Any deposit payments must be pre-arranged with Hoo Bears. We will not "layaway" a bear for more than 6 months, and a minimum non-returnable holding deposit of £30.00 GBP per bear is ALWAYS required. Insured delivery is charged at cost price. Carriage will be by Royal Mail 'Signed For' or Parcelforce Standard services unless agreed otherwise. Contact Hoo Bears for details (typical costs are given below for the UK, Europe, Japan, Singapore, Australia, New Zealand and the U.S.A.). By credit card through PayPal, for which an admin fee of £5.00 may be charged (at the discretion of Hoo Bears). English bank cheque or British postal order made payable to "Helen Oliver". International Money Order made out in British pounds sterling (GBP), made payable to "Helen Oliver". Overseas customers are advised that all currency exchange and customs charges (where applicable) are the responsibility of the customer. Note: These prices should be used for guidance only. The final carriage charge will be notified to the customer in advance and is at the discretion of Hoo Bears. Copyright © 2000, 2002, 2004 Hoo Bears. All Rights Reserved.